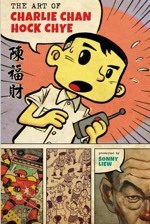 Liew parallels the island nation’s turbulent history with Chan’s life and career, resonating with his personal sketches, photos, accomplished paintings and the ever-shifting subjects, styles and formats of his comics, shot from fading print or original art, some of it previously unpublished. Our guide, an elderly Chan is not lacking in modesty: “Maybe I always destined to become Singapore’s greatest comics artist.” The seed was planted from Chan’s boyhood reading in ‘Pavement’ or ‘Five Foot Way’ street rental libraries. 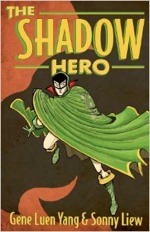 Chan always wore his influences on his sleeve, from Ah Huat’s Giant Robot saviour, his teen debut imitating Osamu Tezuka’s robot manga, or Dragon, his 1957 copy of British weekly Eagle, to his funny animal fable close to Walt Kelly’s Pogo and localised superhero Roachman (below). Throughout Liew annotates the topical politics implied or explicit in Chan’s series, while recreating key turning points in the artist’s life. The reader is pulled inside this double-edged history, pulsing with the tensions and wonders of lived experience. 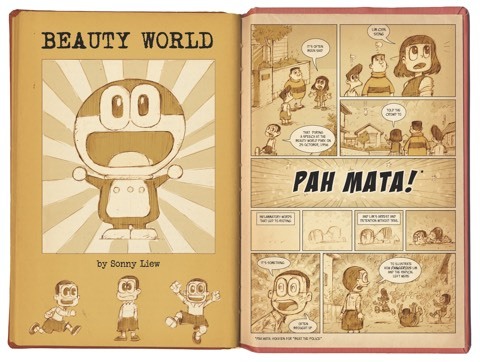 In the vein of the Situationists’ détournement, Liew’s new strip ‘Beauty World’ for ArtReview Asia magazine (below) repurposes the manga Doraemon, about a robot cat who can produce anything from his pocket for his pal Nobita, to revisit a left-wing politician’s contested speech from 1956. 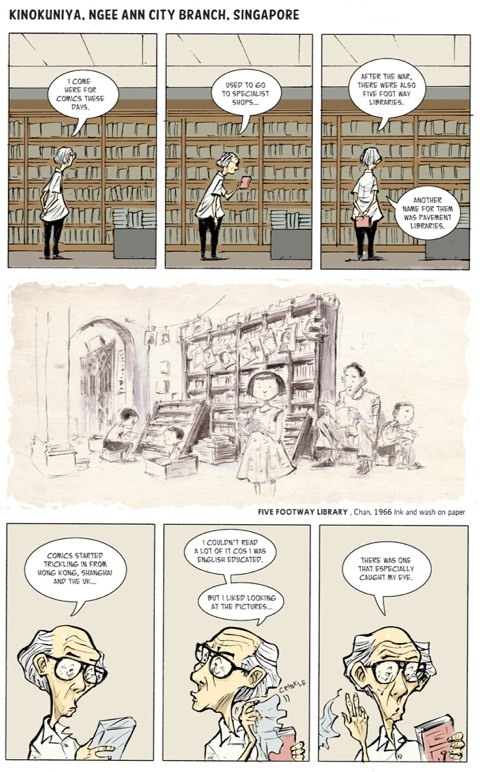 With much recent news in Singapore of yet more communal places of memory being slated for removal and destruction, Liew’s comics of recovery and discovery can connect us to pasts that may become forgotten or perhaps were never remembered. What’s the story about your recent conversion to Singaporean citizenship? My dad is Malaysian and my mom Singaporean, so I’ve always thought of myself as a Causeway Child – one of many who had roots in both countries. My parents sent my sister and me to Singapore for our studies when we were very young, and we’d travel back to Malaysia every holiday. Converting to Singapore citizenship happened a couple of years ago, sparked partly by the 2011 elections; social media allowed people to feel connected, and there was an excitement in the air that had maybe been missing in previous years. 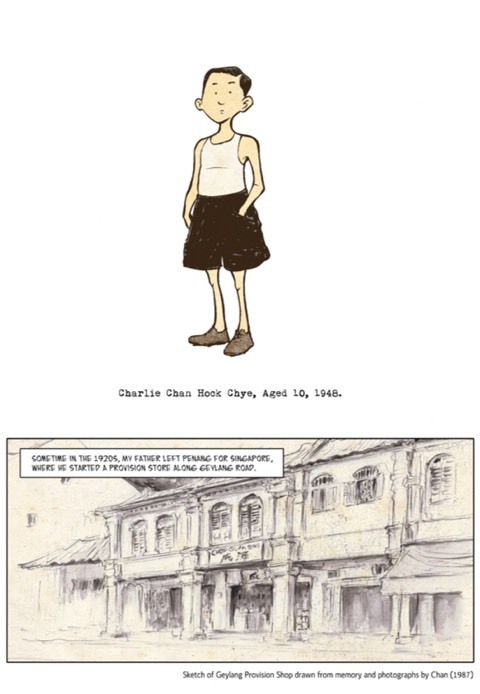 I think writing a comic about Singapore got into my head then, and though I had no idea what it’d be about then, I felt that it was something I needed to do as a Singaporean, rather than a foreigner or as someone on the outside looking in. 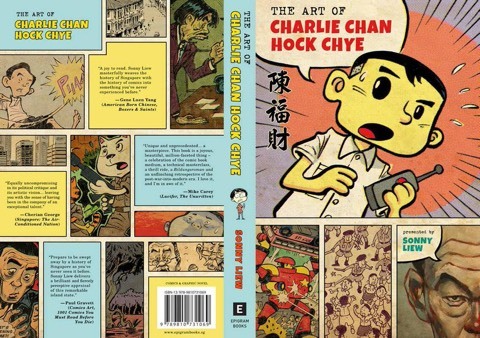 What sparked your ambitious project The Art of Charlie Chan Hock Chye? 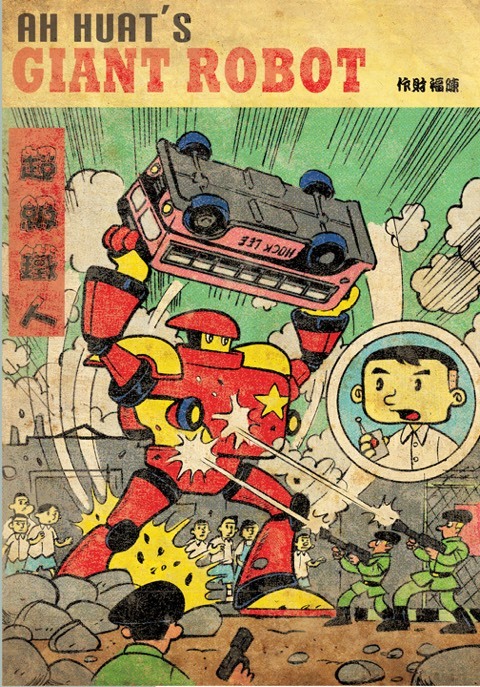 I’d an inkling of the idea a while back, though it was then supposed to be a more general history of Singapore comics. It went on the backburner, but resurfaced a couple of years ago. I didn’t realise what shape the project would take, and the idea then was to have 120-pages filled mostly with essays, as is the wont with “Art of” books. I couldn’t have predicted the 300 plus page thing it finally turned into. How did you uncover this rich seam of almost forgotten comics history? Through a lot of research, mostly! 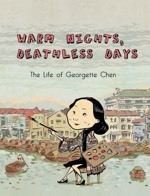 Talking to publishers, writers, historians, reading all sorts of books on Singaporean history. It’s been a real education, one that has helped me understand a little better the country’s past. How did you select the material and put this documentary together? I would say the biggest challenge was narrative flow and structure. 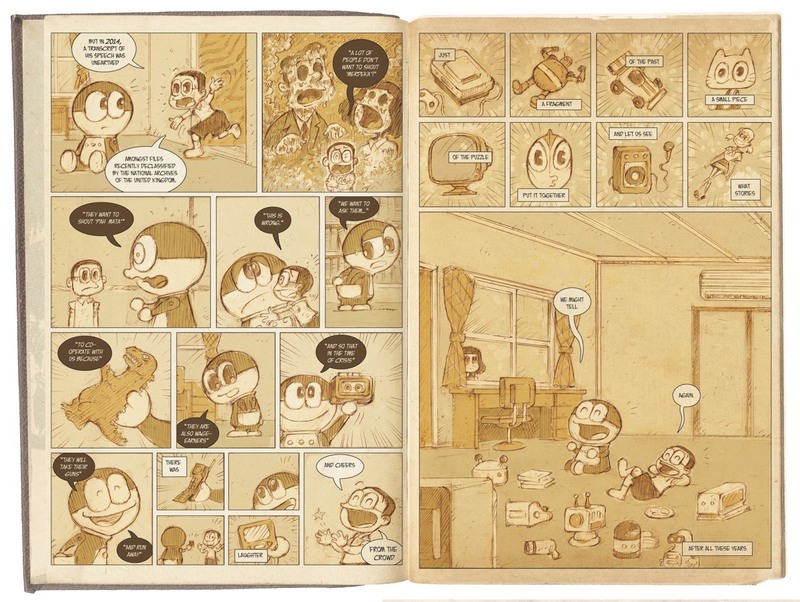 Though initially based on the format of “Art of…” books, I realised that those were essentially coffee table tomes, which you looked at mostly for the pictures, they were things that most casual readers dipped into rather than read in any kind of linear fashion. 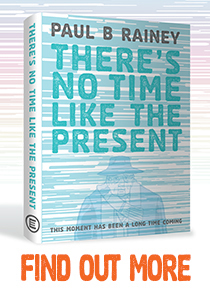 So I tried to fashion a book that drew elements from art books, but which would also be read as a proper narrative – inspired in part by folks like Chester Brown, Harvey Pekar and Scott McCloud. And the challenge then was to piece together all the different elements – interviews, samples of artwork, my own thoughts etc, into a cohesive whole. 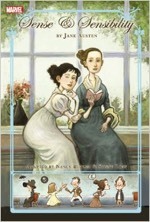 How do you think this book is going to be received? I always hope every book I’m involved in will be a mega-success, but experience has tempered those expectations. 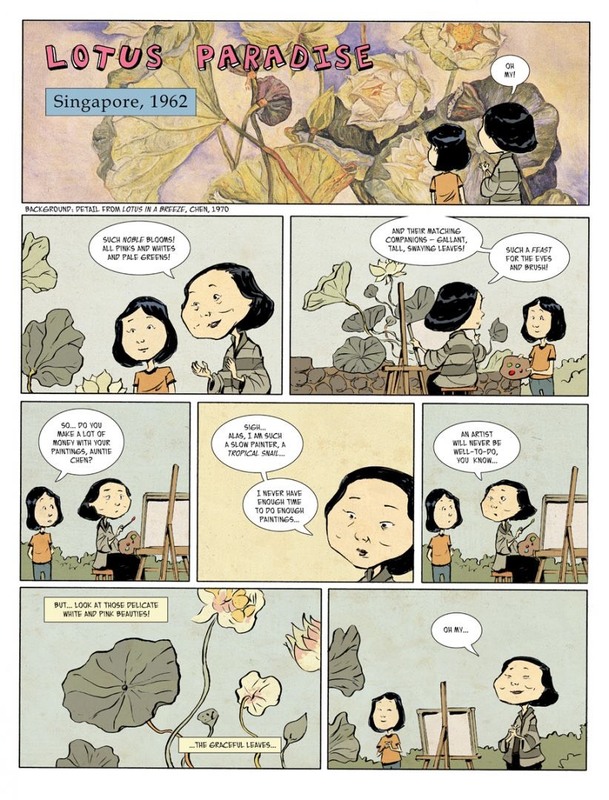 You can’t really predict anything in publishing, and I think the main hope is that anyone who does read the book will be entertained and challenged, both in terms of the way they think of comics and the history of Singapore. How exactly local readers will respond to the way I’ve presented the past – that’s only something I’ll find out when the book is out. 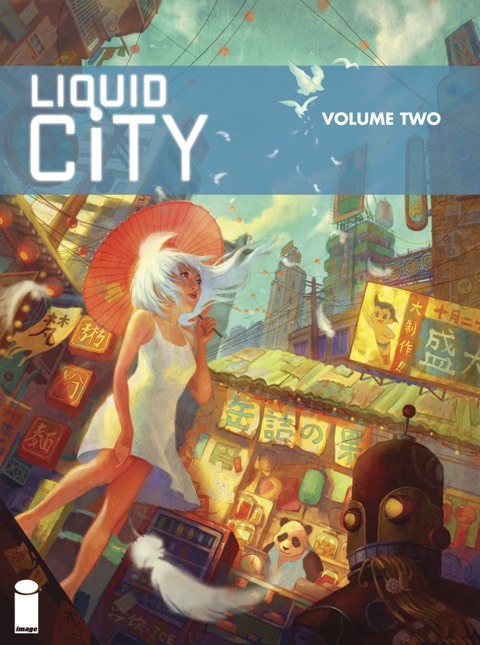 That said, getting the book picked up by Pantheon for 2016 does give it a better chance of being read in the wider world, and I’m hopeful that will turn out to be the case. With the benefit of hindsight, what is your view of SIngapore’s first 50 years of independence? And what lessons can we learn from them for the future? It’s been a marvel, really. With Lee Kuan Yew’s passing last week, there’s been no escaping the eulogies for the man, and it’s clear that he helped to create a Singapore where low corruption and pragmatism have helped create a very unlikely success. But the world and people are filled with endless complexities and contradictions, and I think in Singapore especially, we’ll always have to contest the official historical narratives that would otherwise overwhelm us. That pushback, that resistance, whether through political means, creative enterprises or other channels, I think is an essential component of maintaining good governance. 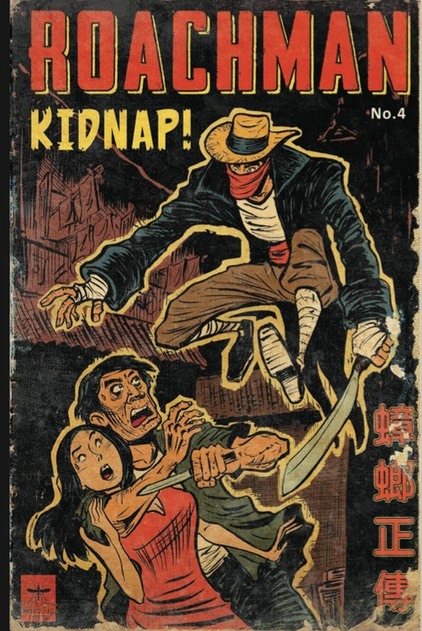 Among the many external influences from Britain, America and elsewhere on Singapore comics, including your own, how have Japanese manga affected local tastes over the years, from occupation to today, among readers and producers? For the better - and perhaps for the worse? 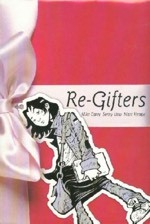 I’m not sure its useful to think of the effects on creators as being better or worse, especially given the deep variety within the umbrella term of “manga”. You can definitely see a lot of artists working in a manga style, but I don’t think that means they’re constrained by genre conventions in their narratives, and creators can and will ultimately find their own voices. 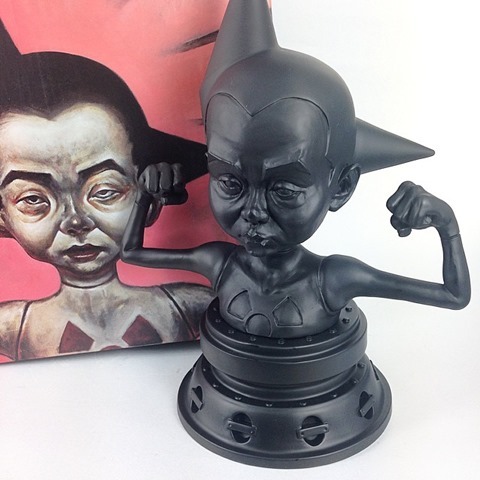 Osamu Tezuka is one of your many heroes - what were your goals with your Astro Boy homage 100,000 HP, sculpted into a bust by Gary Choo for Mighty Jaxx? That painting was done back in art school, at RISD. 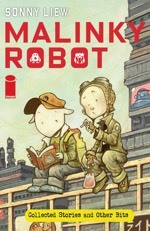 It was part of a series exploring manga and anime visuals themes, so there were others featuring robots, Sanrio icons etc. In this case it was really just about the ambiguities of atomic and nuclear power – so we see a sort of realistic depiction of Astro Boy – both powered but also sickened by atomic energy. 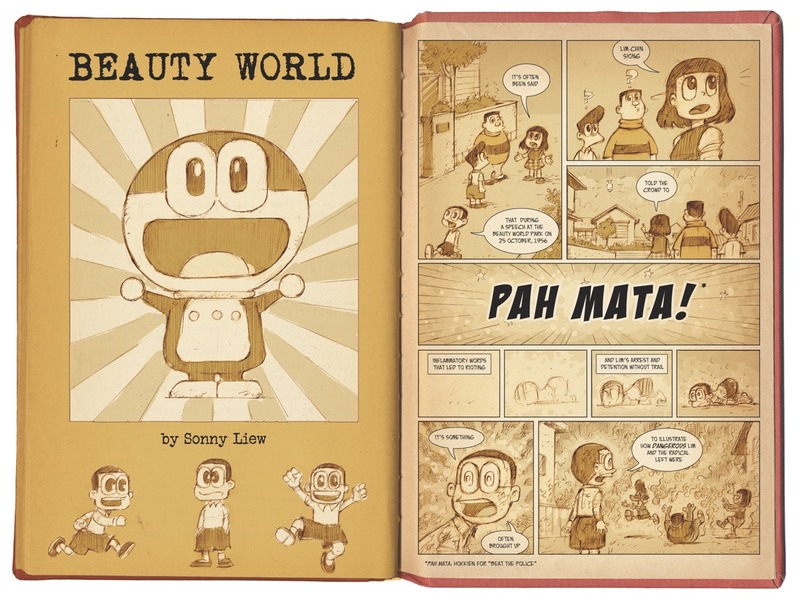 Doraemon is the reference in ‘Beauty World’, your new comic for ArtReview Asia - for those unfamiliar with this phenomenal manga success, what drew you to use this for your own comic? Is this sequence based on a specific episode? There wasn’t really a logical connection between the visuals and the story. 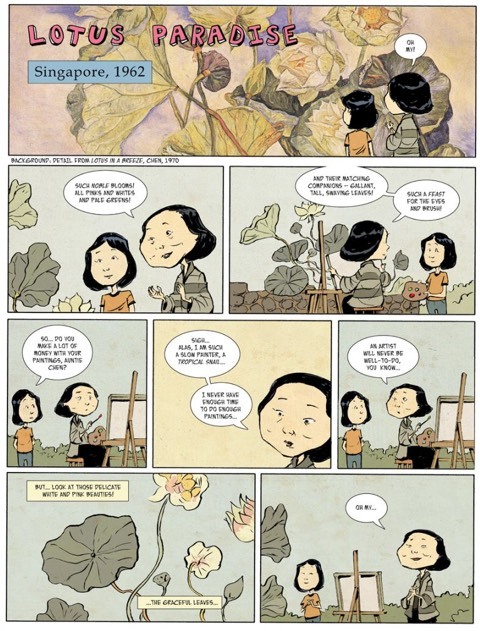 When I initially drew the art, it was for a story that explored the Hiroshima and Nagasaki bombings. I think it came across as a little too on the nose though, so re-tooled it to tell a story about the Beauty World incident. Doraemon was and remains one of the most enduring children’s manga stories, featuring a robot cat from the future and a boy named Nobita. There’s a lot of nostalgia involved in reading the comics, and I suppose you can play off that, letting the text and visuals generate new meanings. What strategy lies behind the contrast and disjunction you create by juxtaposing this humorous children’s fantasy with the text in speech balloons and captions? 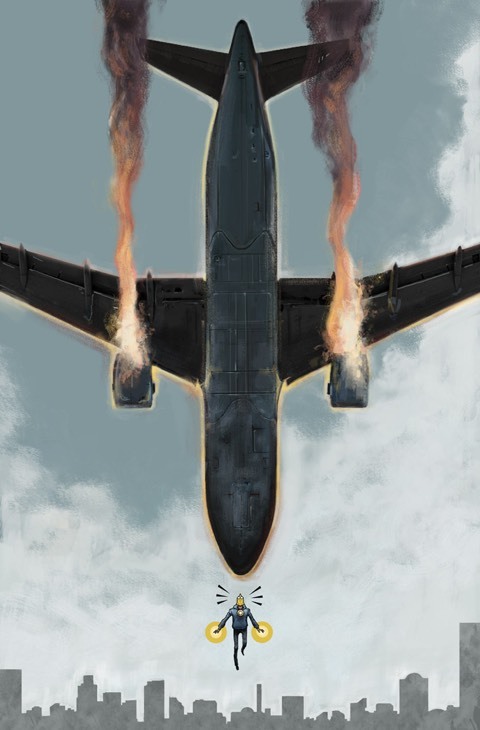 Well… maybe that’s an explanation for another time – I hope readers can read it and come to their own conclusions for now…. In some of your authorial work, you are interested in exposing and correcting the distortions and cover-ups of Singapore’s history. What motivates you to do this and how do you think comics can do this perhaps more effectively than other media? Hmm… it’s not something I’ve done in most of my own comics, but I do think there’s a potential for the medium to explore these issues in a unique way. 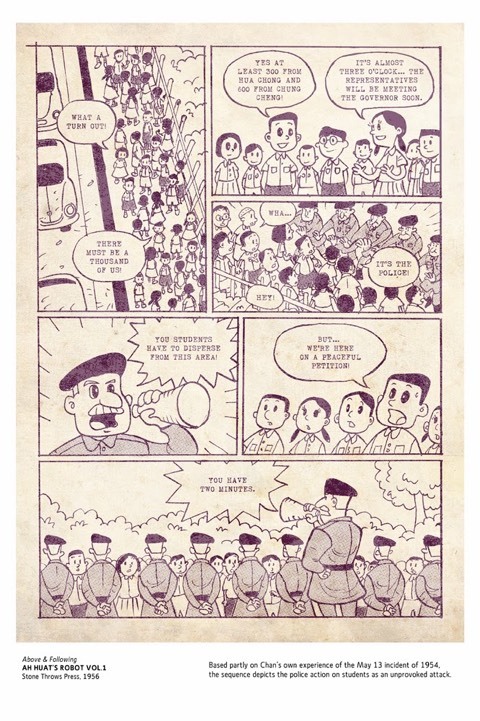 There’s been a slow movement towards a less official interpretation of Singapore’s history over the years, but most of these have been done through more traditional channels – academic books and essays, mostly… so I do hope that comics with its special way of putting images and text together, might be able to convey the ideas in a different and more accessible way. As for the why… I suppose it’s the very human desire for truth-seeking, for reminding ourselves of voices that might have been drowned out. That’s not to say that mainstream narratives are wrong – but a sceptical view of them is healthy, I think, and it is important to see if they stand up to scrutiny; after all, they’re narratives we use to guide our own lives. 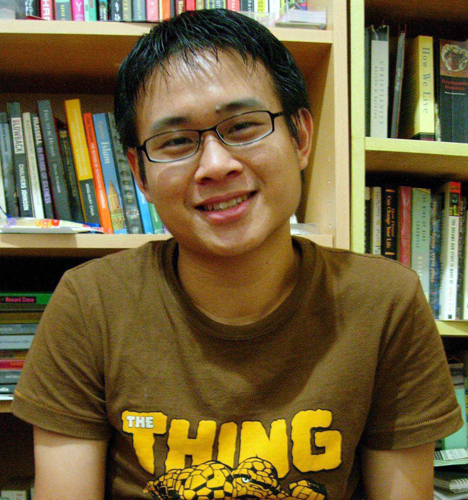 How does censorship and suppression of cartoonists who satirise the government and leaders continue to affect the climate of current Singapore? Can this change, if so how? 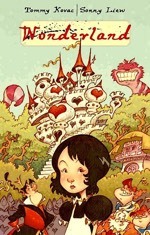 The recent case I remember was the cartoonist Leslie Chew brought for questioning for his online comics. Demon-cratic, I think it’s called. There’s definitely still a sense that you can get in trouble for overstepping boundaries. For myself it means that you really have to do your research when you’re venturing into political commentary, try to make sure that you have proper sources and evidence for any viewpoint or claim presented. Which might be a good thing, if you think about it, rather than a loose cannon approach where anything goes. How did you break into the American comic book market and what are the pros and cons of working for the Almighty Dollar!? I’m not sure I really have – I’ve felt on the fringes for most part. All kinds of ups and downs. The pros and cons? For the Big Two, the page rates and exposure are excellent… but you might not feel as much personal affinity for the stories themselves. But that’s really a commercial vs personal divide, and I think it’s one that just about everyone struggles with. 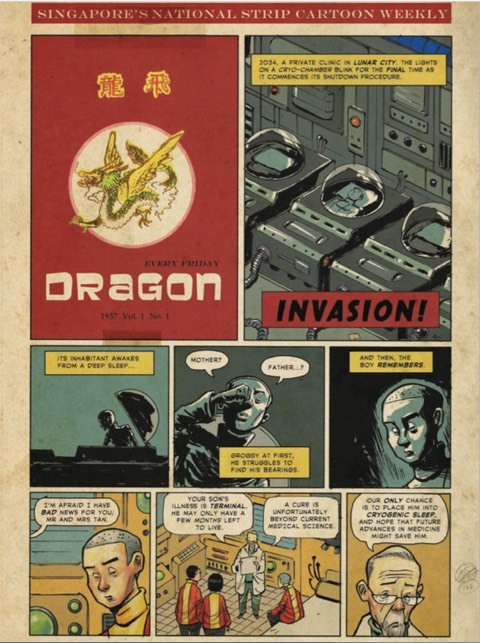 For now, at least, the local Singapore market is too undeveloped to support comics creators, so seeking work in the US does seem to be the most viable way to go. Among your other projects as illustrator/collaborator on other writers’ scripts, your latest high-profile American comic book is Dr. Fate written by Paul Levitz - what new wrinkles will you and your scriptwriter bring to this seventy-something super-magician? To be honest I didn’t know anything about Dr. Fate when I was first asked to do the series. 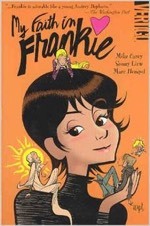 We’re updating the character a bit – a younger protagonist, more contemporary issues. I’m not sure how much I’m allowed to talk about it at this point! Have you been published in Japan? Is it an ambition of yours? Ha, no, not as far as I’m aware. I’ve never thought too much about it, I suppose that’s down to the reputation the industry there has for being quite insular and hard to break into. Way, way at the back of mind I might think that it’s something that could happen on its own, if I managed to do the right comic that did well enough elsewhere. On a tangent: I do wish someone would put together English translations of Yoshiharu Tsuge’s work though, just as Drawn & Quarterly did with Yoshihiro Tatsumi. What I’ve seen of Tsuge’s manga has been fascinating. You’ve been an activist for Singaporean comics to find their own voices and directions, encouraging your peers and the next generation. How does the homegrown scene and community look to you today? It’s getting livelier, though I’ve been so caught up with working on CCHC that I haven’t had the chance to get out much for a while… I guess we still lack a Tezuka or Lat figure here to really kickstart things, though maybe there are other roads that can be taken to get there. Maybe it’s about finding someone with deep pockets to fund a comics publishing business until its able to break even, as I think happened with Gempak in Malaysia. 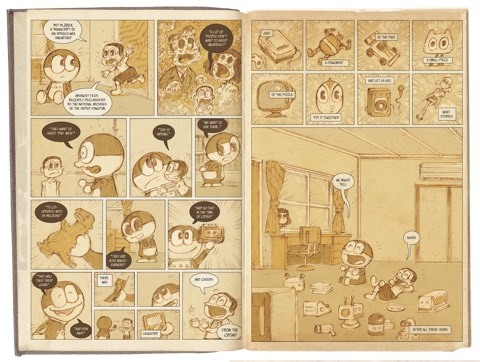 Are more Singaporeans creating comics? And are there more women participating now? I would think yes. From the turnout of students in classes I sometimes teach, there isn’t any obvious gender ratio differences. The bigger question could be whether younger creators believe making comics is a viable career choice, and I think the answer to that is still that it’s not the easiest thing. Who stands out for you among the upcoming younger talents and why? I’ve seen a lot of talented students, but a lot of them probably end up in other, more immediately accessible industries, like animation or computer games. I’m not sure I’ve kept up enough with the scene to name any names though. Comic conventions should be the best place to discover new talents, but the situation in Singapore is not quite ideal in terms of booth costs. But I do follow the work of the creators who were involved with the Liquid City anthologies which I helped edit, and see a lot of exciting work all the time. Folks like Reimena Ashel Yee, Gary Zhu, Jin Hien Lau, Hu Jingxuan and Benjamin Chee, just to name a few. How is the medium gaining in recognition and cultural respect in Singapore and in your view what does the future have in store? It’s still getting drowned out by the superhero stuff, as far as what the word “comics” brings to mind. That’s a testimony to the success of the Disney/Marvel movies – and you can see it in the number of articles that use the phrase “Comic Book Movies” to mean only the superhero genre. The only medium that really gets any attention here is probably film, which might be due to the budgets and glamour involved. Making comics is more of a solitary activity, and its practitioners more likely to be publicity averse. My hope is that creators of all ages continue to work hard at making good comics, and try once in a while to gather and share notes about what we can do to improve the industry. I don’t suppose there’s a quick fix, it’s something we all have to work together over time to change for the better. The main Article first appeared in ArtReview Asia magazine, Summer 2015.